On the weekend of June 10-11, 2017, ULTRA Worldwide will touch down simultaneously in two of Asia’s most thriving cultural capitals – Singapore and Seoul – for an unprecedented intra-continental festival double header. With both iconic cities hosting full-scale events ‘side-by-side’ over the course of the weekend, the international festival behemoth drops two corresponding Phase One lineups. Headliners Dash Berlin, Dubfire, Hardwell, KSHMR (Live), Martin Solveig, Nic Fanciulli, Nicky Romero, Sasha & John Digweed, Steve Angello, Tchami (Live) and Tiësto will be all performing at BOTH flagship events, crossing flight paths over the South China Sea on the morning of Sunday, June 11, in order to do so. 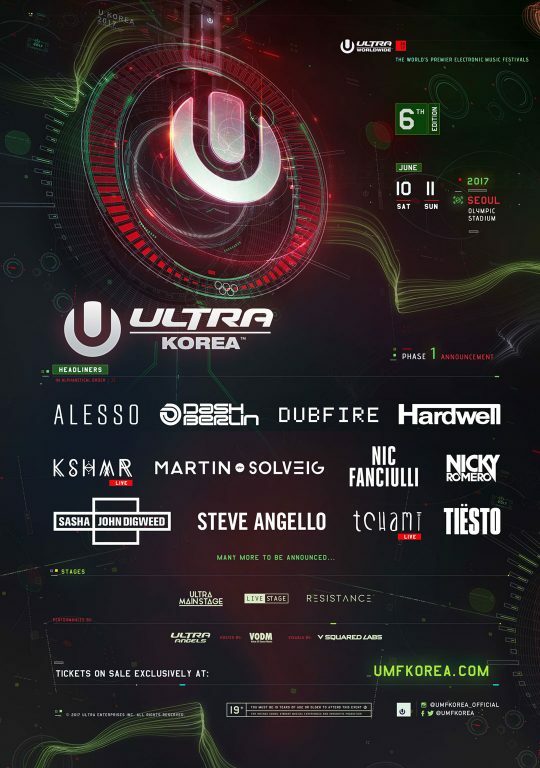 Alesso will perform exclusively in Seoul, having already headlined ULTRA events in Singapore in 2015 and 2016, while Don Diablo, Pendulum (Live), Showtek and Steve Aoki will headline exclusively in Singapore. More international and local acts will be announced in Phase Two. ULTRA Singapore will be returning to The Lion City for its second annual edition, having been upgraded to full festival status in 2016. ULTRA Singapore’s first outing was a runaway success story, as the festival welcomed over 45,000 music enthusiasts from 67 countries worldwide. The internationally renowned festival, which has taken place every March since its inception, celebrated its eighteenth anniversary on March 18-20, 2016 by bringing over 165,000 music enthusiasts to the sold-out waterfront event in the heart of the City of Miami. Ultra Music Festival®, recently voted the world’s #1 Festival by DJ Mag, returns to Bayfront Park for its nineteenth annual edition on March 24-26, 2017. Choosing to follow a unique and creative vision and a wholly organic growth focused on its true love for music, artists and fans alike, the ULTRA and ULTRA Worldwide™ brands represent not only the world’s biggest and most successful remaining INDEPENDENT electronic music festival brand, but also the most international festival brand in the world. Event organizers continue to transport the unrivalled experience from the Miami flagship festival to an ever-growing number of destinations and Ultranauts all over the globe. Over the past eighteen years, thousands of the world’s most iconic DJs, producers and live acts have mesmerized audiences with awe-inspiring sets at ULTRA festivals in ARGENTINA, BALI, BRASIL, CHILE, CROATIA, IBIZA, JAPAN, KOREA, SOUTH AFRICA and of course MIAMI, as well as ROAD TO ULTRA® events in BOLIVIA, CHILE, COLOMBIA, JAPAN, KOREA, MACAU, PARAGUAY, PERU, THE PHILIPPINES, PUERTO RICO, SINGAPORE, TAIWAN, THAILAND and the USA. Each new global edition has been founded on the same successful recipe that has been perfected over eighteen years in Miami, combining the most diverse electronic talent with the most technologically advanced, large-scale festival productions in the world. 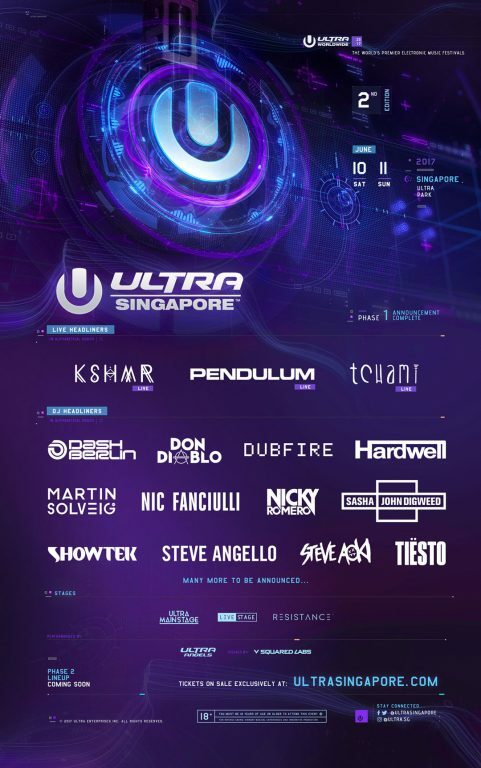 The ULTRA brands have pioneered the live stream experience with ‘ULTRA LIVE’ (bringing the festival online to over 20 million unique viewers globally) and the audio broadcasting platform ‘UMF RADIO’ (syndicated to FM Radio in over 62 countries and reaching more than 22 million listeners weekly). Also UMF FILMS’ collaboration with FINAL KID has seen some of the most visually breathtaking festival aftermovies in the music space, including a feature-length documentary exploring the explosion of dance music, entitled CAN U FEEL IT™, which was premiered on the red carpet at the Klipsch Amphitheatre in Miami in 2012 and was exhibited in over 500 theaters across the Unites States. 2016 saw the ULTRA and ULTRA WORLDWIDE™ brands continue to push the boundaries even further, bringing an unparalleled combination of cutting edge productions and the world’s best electronic acts back to previous strongholds and new frontiers across the globe. With the SOLD-OUT edition of ULTRA Brasil® Rio de Janeiro on October 14-15, ULTRA Singapore™ having become a full scale two-day festival on September 10-11, RESISTANCE’s standalone South America Tour and ROAD TO ULTRA®’s Hong Kong debut, the ULTRA brand has now united TWENTY COUNTRIES across FIVE CONTINENTS worldwide. In 2016 alone ULTRA WORLDWIDE™ produced TWENTY-SIX events spanning SEVENTEEN countries and FIVE continents.